With Heart and Voice presents sacred music that spans the full range of Western classical music, from the Gothic period through the 21st century, with occasional surprises from the non-western tradition. The program, hosted by Peter DuBois, celebrates the seasons of the liturgical year and focuses on the richness and beauty of sacred music. 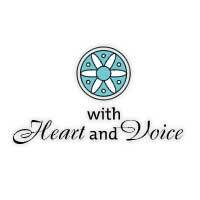 With Heart and Voice began as a local Sunday morning program on WXXI-FM in 1975, and has been broadcast nationally since 1989.